a) EBIDTA of HI remains same as of last year’s H1 ,this is despite 32% increase in export. Export always give better margins. So can we assume that total profit from domestic business has decreased as compared to last year ( as domestic business growth is 24%)? b) Let’s also keep in consideration that prices of almost all the molecules have gone up (15-20%) due exchange rate issues, tight supplies from China etc, so would need to check what is real volume growth in domestic business or it is just value (price-increase) growth and that too at lower margins than last year! Has been doing ~25 molecules at present at the commercial scale. Has commercialized 4 new molecules in FY18. Planning to commercialize 2-3 new molecules in FY19, of which one has already been commercialized in 2QFY19. The volumes of these new molecules is expected to ramp up in FY20. Order book of CSM business stood at US$ 1.15bn in 1QFY19; executable over the period of 3-4 years. Top 30% molecules contribute 70% of the order book. Currently operating its plants at a ~90-95% capacity utilization. Fresh capacity in Jambusar (i.e. two new plants IV & V) is expected to come on stream from Dec '18 and Jan '19. One new plant is for agro chemical and another for new chemistry (early intermediary in Pharmaceutical sector). 70 products in R&D pipeline at FY18 end. Sharp jump from some 30-35 products in pipeline earlier. Includes Fine chemicals and Electronic chemical products in addition to usual Agro-chem products. PI currently has 65-70% market share in the Bispyribac sodium market, through its brand Nominee Gold. Bispyribac Sodium’s market size has grown by around 43% YoY to ~1,000KL . Over the next two years, it is expected to grow at a CAGR of ~40%+ to reach ~2,000KL, largely led by deeper penetration. The price has corrected by ~15-20% from its peak due to generic competition. Management expects the pricing delta between PI and generic players to remain stable going forward. PI has applied for the registration; expecting registration anytime now. Post it will start producing Bispyribac sodium in India. Osheen, a broad spectrum insecticide (launched in FY13) continues to be a blockbuster product for PI Industries and it has been growing at a CAGR of 80%+ over the last two years as the co expands its offering to multiple crops. Management expects Osheen growth to continue in the range of 35-40% till FY20 and expect to return to stable growth of 15-20% from FY21 onwards. Co has a strong domestic product pipeline lined up till FY22 and it has planned to launch 4-5 new products every year. In FY18, the co has launched five co-marketed products (Fender, Header, Visma, Elite and Humesol) and management has highlighted some of the products have grown more than 100% in the current season. PI has planned to launch 4 new co-marketed products in FY19, of which two products were already launched in the 2QFY19. Expecting 18%+ kind of growth in FY19. 45-55% broad split between 1H and 2H. Expecting 20-21% OPM for FY19. Around 21% tax rate in FY19 (was much lower in FY17 because of 100% abatement available then). Source: Management meet note (here) and earnings conf call transcript (here and here). PI Industries’ Q2 & H1 FY19 Earnings Conference Call is schedule on Monday, Oct 29, 2018 at 11:00 a.m. IST (Dial-in details here). The company is optimistic about a good Rabi season in South India due to good presence of water reservoirs in the region. The monsoon season has seen sufficient rainfall in key areas. While rainfall was overall short,its timing was favourable. MSP price increase too provided respite by driving farm incomes higher. Q2FY19 margin is lower because of steeper R&amD and higher cost of raw materials from China. R&D spends higher by 20% YoY. The margin contraction seen was in both the CSM and domestic agrochemical segments. PI Industries expects capex of Rs 300 crore for FY19 and Rs 200-250 crore each in FY20 and FY21. PI industries have strived to diversify the CSM business by including pharma but that is still not material. Total revenue grew by 29 % to 723 Cr compared to previous quarter. Domestic revenue grew by 24 % compared to previous quarter due to enhanced growth in portfolio of branded products . Export revenue grew by 32 % compared to previous quarter due to increase in demand of existing molecules as well as introduction of new molecules. EBITDA stood at 135 Cr for the quarter with EBITDA margin stands at 18.7 %. PAT grew by 17 % to 94 Cr compared to previous quarter. There was sufficient rainfall in the key cropping areas this season. Consequently, crops like rice, sugarcane, oilseeds are showing higher productivity YOY as per advance estimates. Central Government’s new MSP announcement during the quarter provided much awaited respite, to the farmers of pulses and many other crops. Driven by the overall positive sentiments, sales volume finally improved including crop protection. Company focus is to build up strength in key crops in potent combination of brands that can directly enhance farm yields and productivities. This season saw the introduction of two new brands ‘Fantom’ and ‘Cosco’ which have received encouraging response from the market. Some of flagship brands including the ones launched in the past two to three years have also demonstrated healthy traction during the quarter. During the Kharif season company have carried out some unique farm extension initiatives in selective agricultural areas including engagement with the farmer to help them advance farming activity by getting them new technologies. These initiatives are very well received by the farmer, resulting in substantial increase in productivity. Company is now working to intensifying these initiatives across various other agricultural areas in next few seasons and make the solution available on a pan India basis. On export front company is seeing an improvement in global demand scenario reflecting in the increasing trends of export revenues. Shipments now will be improving QOQ as expected and enquires also translating into firm orders. Company have commercialized two new products in the quarter. Overall there is substantial growth potential given the current R&D pipeline. Portfolios have extended early stage molecule, also long-term orders at hand from global innovators. Company is overseeing the augmentation of Jambusar capacity with additional two new plants and this also gives company an increased headway for delivering growth. Will company upgrade its revenue guidance because company has already beat the given guidance which was 18-20 % for the full year ? Is there any R&D related component in gross margin ? When did company expect the gross margin to normalize ? The second half is obviously expected to be scaling up and good for the CSM supply, export supply. But at the same time the domestic season relatively compared to the first season is soft. So, in that sense company would still want to maintain its original guideline. Company expect to be at 20 % revenue growth for the year. In first half there is a significant portion of first half revenues and business is related to domestic production and supply and there is a lot of imports for that. So rupee depreciation impacted there. With spurt in crude and derivatives prices many raw material prices have also gone up over last six months, eight months and there is obviously a lag effect . Company has taken price increase across the products both for domestic as well as export but there is lag effect. Now the price increase has been done and past to customers so gross margin situation to certainly improve over next couple of quarters. Does the gross margin pressure was across both domestic as well as for CSM? Kindly update on the new plants that are coming in ? In one plant there is capacity expansion and second will have backward integration. So, it may not result in increased revenue to start with but over a period . Company will add more products and this will add to revenue. So, these two plants are on the additional capacity but apart from this also company is investing in debottlenecking during next couple of quarters and that will also help company to achieve 20 % plus kind of growth. The Debottlenecking initiative which company talk in last quarter has started showing result in this quarter out of 32 % growth some has also come through debottlenecking initiative. What kind of order book company is looking in FY20 ? It is around the same level because whatever small increase was there company had good invoice in this quarter. So company have maintained almost the same level. There are a lot of products in pipeline and negotiations are on. So the outlook is very good for the coming years and company will be finalizing several long term contracts in next few quarters. What is the company constant currency growth for export business in the quarter ? The growth is come through volume increase not through exchange because exchange overall is broadly same compare to last year. There is a small delta which come through exchange. But growth is mainly by volume and some by price. Did company hedge 100 % of export ? No company hedge it partially because company do export and import both. In Q3 did there will be some respite in margins because of the lag effect kicking in? Company expect margins to improve in coming quarters that is basically coming from all these initiatives. What is the impact of revenue that got shifted from Q1 into Q2? In first quarter company have some shortfall In H1 there is immaterial mpact on the overall numbers, so H1 versus H2 of last year, the carry forward numbers are broadly same, so these numbers are comparable. But this also means whatever Rs. 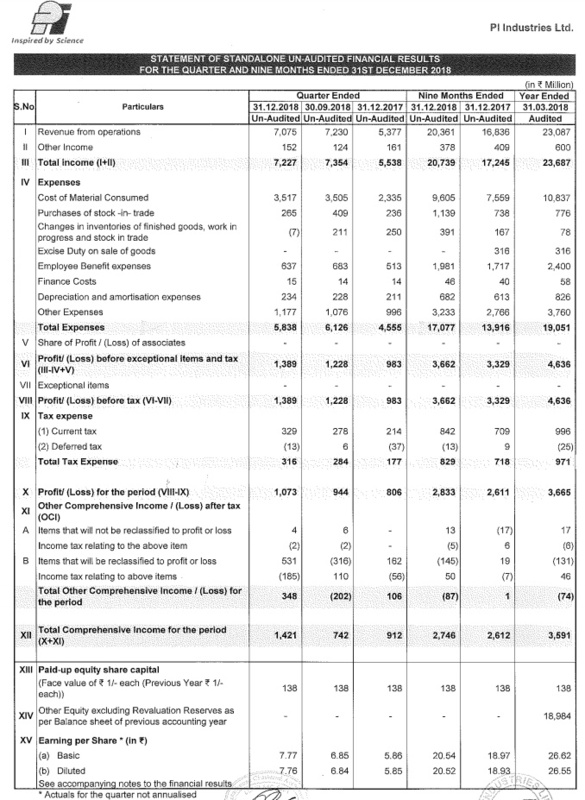 74 crore of opening impact which company have taken that has gone in balance sheet and company is not counting it again on results. Why there is a jump in receivable days ? Basically, receivables have increased, sales are towards the end of the month and end of the quarter. So, the moment company have high sales towards end of the quarter, receivables will be high. It is a timing issue. It gets liquidated the moment the normal cycle happens. Number of days broadly remain same, it has not changed but yes, it changes because the skewness of sales. Do company take full year hedge at the beginning of the year or do company roll it quarter on quarter ? As per policy company do not take one point of time entire hedge. Company have a three year long-term hedge policy and company keep hedging as per policy. So every quarter company keep building hedge book accordingly. In the given percentage range which board has approved company will remain in that. Will the benefit of currency depreciation will be reflecting over the second half ? The whole business model of export is not at all dependent on currency appreciation and depreciation. So, eventually in the mid to long-term this gets adjusted in the price. So, company said that the margin or gross margin should improve, that would mainly be driven from the price corrections because of raw material price increases and other things. That effect would be there and the lag effect that was there in first one or two quarters will get settled and therefore company will see a normalized margin situation from next quarter onwards, but that is not account of currency benefit or something because the currency benefit in mid-to-long-term gets adjusted in price. Only advantages is that company see this currency particularly for export it that it makes company supply from India more competitive compare with other countries. So, that is the advantage obviously a manufacturer and supplier get from India. What is the current company market share and in which segments company will be able to gain market share ? Company is leading with 50-75 % . Company is not present across various crop such market segments but the segments that the segment in which company operate in that company is leading. What kind of domestic trend company is seeing because of normal rainfall this year ? In raw material prices impact again, how is the market situation and what do company see ? Rainfall is below but the overall cropping acreages have increased. Also the reservoir conditions in the south are much higher level that they have been in the last three years. So, it is expected that the season going forward would definitely be much better than what has been in the past. Obviously, China situation has had negative impact on the raw material prices, cost of products have gone up and also further added by the depreciation in the Indian rupee which has not been so easy to pass on to the markets. On the other hand, while MSPs have been announced so the challenges of the issues in the input space and it is expected that it will be better than last year but there is not going to be a substantial change in this space. Did company can still achieve 21 % of EBITDA margin for FY19 by taking price increase and correcting the timing differences in the coming quarter ? Why currency impact was not there on revenue ? Because this was immediate impact in this quarter and since company slightly hedge in advance so company do not see any impact immediately coming in this quarter, eventually it will come in, but not immediately this quarter. Did pricing is set every month ? No it is set on every campaign. So some campaign are for 3 month , 6 month or a year. Company revenue is in dollar terms so if company continue to get one dollar only, that rate was Rs. 65, now it is Rs. 75, until and unless company reduce the prices so did company will reduce the prices and will company be reducing the prices and with reduction in price did company is going to witness the margin pressure ? No, there are two different issues. One is the raw material impact passthrough. Second is the currency impact pass-through. Earlier what company was discussing was the currency impact Simple thing is raw material has not changed, the simple thing is that if rupee is depreciated dollar price will also come down because the denominator has changed. But if the raw material also there is increase, then obviously the price will have that much impact as well, the raw material increase or reduction in price. In general company margin will come down because company dollar pricing will remain intact and with the currency depreciation company margins will look like on a lower side now ? In a static product, yes, but then there are new products being launched, there is a scenario where demand is chasing capacity, there are many other factors. Margins will come down not maybe in absolute term, but looking to the various other aspects which are currently playing company expect to maintain them at the earlier levels. What is happening at the end user market which is the agro chem market, they have been in the last couple of years, lot of consolidation which has taken place, and how company is seeing it in next couple of years and how company is seeing the environment changing both from the China as well as the end user market? Where is company in terms of adding pharma and when will pharma come in overall CSM business ? How the market is shaping up ? Industry is in consolidation and things are settling down , companies have now aligned themselves to taking to the next phase of their plans for growth and clearly the advantage is one sees out of this are one, that the companies are consolidated, they are focusing on the new product portfolios which are high contributing and larger capabilities of growth. Where is China playing a role in agrochem right now and does client are looking for second option of sourcing which probably in India defacto company become one of the major suppliers or partners ? In China the situation has been challenging and continues to remain challenging from company partners point of view. w. Clearly, these is creating a huge opportunity for India for Agro-Chem and fine chemicals and obviously PI being one of the oldest trusted partners and that’s the opportunity for company to look in a very positive direction. So it will take time to China to get settle but at the same time China have certain core strengths in some of the basic chemicals and it will not be easy to replace by India. What is the absolute number of R&D in H1 FY19 compare to H1FY18 ? On domestic business side the margin pressure is purely because of RM or does company is seeing change in mix also now that is impacting the margins on the domestic side and how would they evolve over the medium term as new products come in? R&D has definitely gone up more than 20% over last year. How did company see margins evolving in the medium term ? The raw material price impacts are getting passed on and price corrections are being taken up for several products. So, all in all the margin profile will only improve in coming quarters. Company is e also seeing that with this good reservoir situation, the Rabi season should also play out well. If the demand scenario is also good, that will help company to improve and correct the margin. In CSM did company is operating largely on per ton absolute number ? There is no fixed model of business or commercial contracts, there are different models, some are cost plus, some are depending on the technology, enforce and company share of process improvements in that molecule, the pricing is decided accordingly. Whole capacity of debottlenecking has been largely done for the CSM side of a business? Did demand from the innovator side is increasing, that is leading to this kind of debottlenecking? There are both these factors; one is that the demand for existing product is increasing and at the same time company is also adding new products, new products are getting commercialized and they are also driving the growth. How company manage to gain share is there any specific crops that have worked well for company ? Yes basically focus on specific crops and crop solutions and overall portfolio of company products have done well. In terms of investing where does company see the opportunity , that would help company to understand the strategic direction a little bit better? Granularity is obviously process technology areas and looking at certain building blocks as mentioned before, and that is where company would be looking at. Did non-agro chem segment started to make a meaningful contribution now ? Not as of now company expect that in few years. What is the total percentage of goods company is buying from China and how the inflation has hit company on that areas ? Now in new scenario which is emerging where the pricing power is shifting back to intermediates would that require a pricing power is shifting back to intermediates, would that require you to do a lot of CAPEX on the backward integration part of it and kindly explain the strategy going forward ? As a strategy company is gradually reducing the dependence on China in terms of sourcing these basic raw materials of intermediates. Over last three, four quarters, company have already developed various alternatives in India or outside China in some of the other Asian countries. Currently, maybe close to 17 to, 18% of these raw materials are coming from China. Company is constantly working on that front. Company is also developing few other alternatives but for some of these basic chemicals, China has got some unique advantages and therefore that much dependence will remain there. In terms of price inflation whether it is procurement from China or from other countries mainly because of crude and crude derivatives, pricing trend there was spurt in prices over last six to nine months overall in these raw materials, so that has been there and that has also been passed on to the customers, so that is the trend there. Did any change in the inflationary scenario of the raw material will be passed on to the customer maybe with some lead and lag irrespective of company change its geographical location or the sourcing of the raw material ? If company have to invest and do CAPEX to secure these kinds of raw materials, would that mean that company return on equity over a period of time should go on a lower side? It does not mean that company will invest in backward integration of all major raw material, that is not the kind of strategy that company have , there are several small to mid-size players in India and outside India who are interested or who have the unique capabilities of working in these chemical areas. So company is doing tie-up with them and giving long term visibility and they are very happy to get into long term understanding with company to supply these intermediates and raw materials as company were getting earlier r from the Chinese suppliers. So it is not necessary that company will invest in backward integration for everything. In global agrochemical cycle can company give some insight that is there is a huge cyclical recovery into the global agrochemicals cycle or is it just some temporary blip. What are the factors which will give company huge growth ? There is a huge recovery but there is certainly some upturn in the cycle. In last couple of years there was a de-growth; first there was 8 to 9% de-growth, followed by almost 1% d-growth and something like this, over last three years there was a de-growth in the global industry. Now, what is happening is that because the inventory levels have come down quite sharply over last couple of years, the demands are again coming, if not substantial growth this de-growth will certainly get arrested, maybe with some marginal growth and in selective products portfolio at early stage molecules it should certainly benefit because these kinds of products will grow faster or at a higher rate than the old mature products. Company is expecting good growth in next couple of years driven by global trends. In next 2-3 year how do company see growth in CSM segment in next two three year ? Company is seeing 20 % kind of visibility. Now company have to see how debottleneck capacities, build new capacities because there is very good visibility, there is very good portfolio of products that company have. It is a question of now execution and delivery and this is what currently company is focusing on. As China is easing out some of rules on environmental side so does it will ease out the pressures on the commodity side? Yes This is basically a kneejerk reaction to the current economic situation there which is seemingly lower than what is published. So, they are probably easing out some of these restrictions to bring back growth particularly in chemicals, this would certainly then result in availability or reduce uncertainties on availability of some of these raw materials and so the pricing. In next few months things should streamline or settle down. How do company see margin to stabilize more from medium term kind of perspective? Company will sustain 21 % kind of margin level because company will be getting operating leverage benefit with the increased revenue or high growth but at the same time company is also investing in technologies and new areas of process technologies, that will balance some bit of it, but company is quite confident and hopeful of sustaining and maintaining these margins levels. Is their any difference in quality of business that is coming to company compare to earlier ? If currency remain at current level so does it impact business on CSM side, does it lead to lower margin because of this whole accounting, how does the renegotiation happen with company from a customer perspective does company will end up passing on all the gains of the currency fluctuation to the customers? No It helps in making one more competitive than other geographies. So, this is a positive side, if for example, if a manufacturer or a supplier is competing with someone in Europe or in China or US, it would certainly help in terms of making that supplier more competitive. As far as the sharing of this benefit and all, it all depends, it varies product-to-product, there is no fixed formula for this because for each molecule, for each product, company contribution , position in terms of finding and adding value in terms of most viable process, bringing in a lot of value in these processes, that changes the commercial proposition for each product. So, there is no fixed formula here. There many new products getting added, more demand chasing less capacity, this is a very positive and favourable situation and therefore company believe to sustain he kind of margins that company have been working in both the segments. Over a longer term period what sort of margins company is looking for ? 20-21% which will be sustainable level. With increased scale of business will the margins over a period of time sort of trend higher ? Company will get operational leverage at the same time company is also investing heavily in the newer process technologies for diversification and other things and this will balance out. Company keen interest is to sustain long-term growth and if company will sustain this long term growth than company will need to keep venturing into these newer verticals, diversifying to newer verticals and which will require some sort of investments. In rising material prices how much can company pass on , how are the contracts awarded ? From domestic portfolio 30 % is consist of generics so out of remaining part of portfolio How much of it can company absorb with rising raw material ? In raw materials price increase there would be some lag g particularly in short-term contracts, but in long-term contracts and in any case campaign-over-campaign, all these price increases or cost increases are pass-through and they get adjusted in prices which will improve in coming quarters as margin situation improved. The nature of portfolio for domestic, more or less 70:30, 80:20 kind of situation where 80% are exclusive and co-marketing products, but these 20% products are also gradually reducing as some of these products are getting phased out, most of these products would be exclusive or co-marketing over a period of time and there ultimately pass-through or cost pass on particularly in domestic market depends on how the overall competition is working and how the competitors, what kind of strategy that they are working. So, these are the products got segmented, if it is exclusive kind of products because in competitive scenario there are a couple of other products, those strategies or strategies of those suppliers will have to be also taken into account and this is what happens. Because of rupee depreciation, because of raw material increase, cost has substantially gone up in the last six to eight months, also reflecting in the results of some of these companies and people have already started passing on these costs in terms of price correction and this will reflect in prices and margins. What is the CAPEX plan of the company in the next two years? This year company have a CAPEX plan of almost Rs 300 Cr and even for next two years company is looking for Rs 200 Cr kind of CAPEX because many projects are moving from R&D to commercialization, overall demand scenario is quite encouraging and positive, which would mean that there are many growth opportunities and obviously particularly in exports company have to build capacity to realize these opportunities. In 2018 how was the CSM market size in the global Ag Chem market has grown or that has also declined in 2018 and how is company market share last year ? In 2016 there was de-growth by close to 9%, 2017 it was almost flat and 0.5% degrowth or something, 2018 which is current year it is expected to grow may be couple of percentage because some of the markets particularly, for example, North America, Brazil have done reasonably okay, so couple of percentage growth in the current year is what company is expecting although still couple of months are remaining in the current year. What could be the size of CSM market now in billion dollars? It would not have changed dramatically because the customer market or the customer industry size has not dramatically changed, so the market would have also remained almost at a same level. So if one is looking at CSM across the verticals it would be substantially high; $30 billion to $40 billion and Ag Chem will be $4 billion and $5 billion. Company market share is in range of 5 %. Which are the specific product that has done well in domestic business ? In terms of volume, NOMINEE and OSHEEN have both given good growth and also the new products that in partnership with the BASF’s they have shown some good trajectory. What will be the tax rate going forward ? In which part of country did company had done well and which crop has strengthened company position ? Company have done well in all parts of the country. All the crops have done well in which rice was key focus for company and corn, cotton has also done well. What percentage of growth come from newer pro11ducts compare to older products ? Majorly growth was from newer products only. Older products were contributing in single digit. Can anyone explain why ROCE is steadily on decline for last 3 yrs and excessive fluctuation in case of PI? Revenue grew by ~40% YoY in Q3 on account of ramp up in demand of existing products. Revenue grew by 9% YoY despite soft demand in the current quarter on account of poor pattern of rainfall in rabi and low agri produce prices. Demand upsurge in exports and excellent product portfolio in both for domestic and export markets. Substantial scale up in exports over the last couple of quarters in line with overall improvement in global sentiment. The order pipeline is rich and working with innovator partners to introduce novel molecules globally. The domestic business has seen headwinds in this quarter from erratic rainfall in key agrarian states and poor price realization in the key crops. This has impacted demand and industry is seeing higher than average inventory levels but with a range of differentiated offering, PI has reported commendable results. Next phase of growth will be driven by continued investments in new plants towards leading technologies and processes. Have recently commissioned a new multi product plant and construction of two more plants have commenced. Exports will be driven by higher momentum from ramp up in existing products and new introductions. export 40% growth to 540cr. pat 107cr - 33% growth. 21% ebdita margin guidance in fy19. rising momentum and long term demand in the CSM business. Building capcity - one MPP commisioned in dec for CSM - 155cr capex, one will be commisioned next qtr (new technology + partial backward integration) , two more MPP construction started will be ready by Jan 2020.
around 20%+ growth for next several years in CSM business. 60cr additional revenue in this qtr - due to indas (I could not catch this part). organic effort in several products in pharma continues and keep evaluating on in-organic side. asset turns of 1.5-1.6 in this business. order book of 1.3b USD which is up from previous qtr. overall agrochem scenario is improving - for products we are doing (early stage products). global inventory reduced. confident of sustaining 20%+ growth in this business. this year 20% growth in csm. continuously invest in r&d - staff costs, exploring other verticals in chemistry to keep sustaining growth - development expenses. paddy has been this bad this season - and paddy is the key crop for PI products. china is stabilising compared back to two qtrs. china may go easy on pollution, though its not yet normalised. dependency on china will reduce further in another 6 months. earlier confcalls company used to maintain around 200-250cr capex for next two years, now they are saying 300-350cr for next two years. Company is investing a lot in terms of capability of R&D, development of new chemistry platforms to build up for sustained growth from fy20 onwards. company has been continuously reducing its dependency on china. Q3 revenue grew by 32% YoY mainly contributed by ~40% YoY growth in exports on account of ramp up in demand of existing products. Strong growth backed by demand upsurge in exports with improvement in global sentiment and strong product portfolio in both domestic and export markets.  Domestic business grew 9% despite headwinds from erratic rainfall in key agrarian states and poor price realization in the key crops. Growth coming from both existing and new products.  The EBITDA guidance is maintained at 21% to be contributed by better product mix and improved realization and operating leverage benefit.  Company is gradually reducing the dependence on China in terms of sourcing of basic raw materials of intermediates, already developed various alternatives in India or outside China in some of the other Asian countries. Currently, less than the 20% of the raw materials are coming from China as compared to 30%-40% few years back.  Commissioned one Multi Product Plant this quarter, other plant to be commissioned by next quarter. Construction of two new plants started, to be commissioned by Q3FY20. The company guided CapEx of INR300-350 Cr. every year moving forward for some time. Revenue grew by 32 % to 708 Cr compare to 538 Cr last year same quarter. EBITDA grew by 42 % to 149 Cr compare to 105 Cr last year same quarter. EBITDA margin stood at 21 % for the quarter. PAT grew by 33 % to 107 Cr compare to 81 Cr last year same quarter. Export operation reported 40 % growth during the quarter up from 386 Cr to 540 Cr. Domestic business grew at 10 % up from 152 Cr to 167 Cr. Revenue grew by 23 % to 2036 Cr compare to 165 Cr last year same period. EBITDA grew by 12 % to 401 Cr compare to 357 Cr last year same period. EBITDA margin stood at 20 % for the quarter. PAT grew by 8 % to 283 Cr compare to 261 Cr last year same period. Cash surplus was at Rs 204 Cr with D/E ratio of almost zero. Recently commissioned a new multiproduct plant and construction of two more plants have commenced which will commissioned in FY20. On Domestic side company witness consistency of rainfall in central and north east India. Key Challenge has been the low price realization farmer of agri. Current order book is worth 1.3 US billion dollar. Majority of revenue come from paddy crop. Company have reduce dependency on Chinese supplier from 35-40 % earlier to 20 %. Continuing to invest in technology , R&D , Staff cost and chemical verticals. Expect 20 % plus growth rates for next several years. CAPEX plan going ahead is 300 Cr per year and mostly will be internally funded. Asset turnover from new plant is expected at 1.5-1.6. China dependency expected to go further down in next 8-10 months. One question that I always wonder - given the current movement towards organic and sustainable growth practices and that already states like Sikkim are fully organic in the very long term is there actually a future for organizations like PI Industries? Per area production in case of Organic farming is less than that achievable in conventional farming. Organic crops are profitable only because the products are charged at a premium. To suffice the demand of its rising population India needs to optimize the per area production of crops. So, the products of PI and other agrochemical farms will be needed more going forward. Moreover, the common mass of India cannot afford the premium prized organic crops. These crops are usually consumed by the upper rungs of the population or exported. Nonetheless, there are enough reports that organic crops are only merginally beneficial compared to conventional crops. Don’t disagree that India or the world needs conventional farming, but I dont fully agree to the view point that organic crops are *just *marginally better. I think we dont know the answer to that yet. And there are enough reports linking chemicals to cancer and other diseases. In my personal view, why consume chemicals if there is potential risk? Yes, money can be saved but at what risk. It may be not risk at all, but I think we dont know it for sure yet. having said that, this post not comment on PI industries.